One of the last things that I always do before leaving Tokyo is to buy omiyage (souvenirs) at the airport. 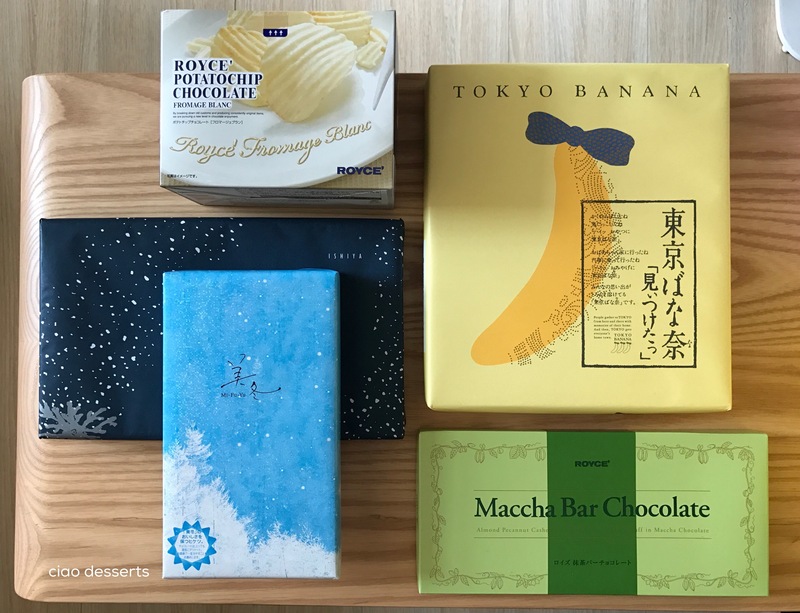 In this post, I thought I would describe some of the omiyage at Haneda Airport, so you can have some more information about what is inside some of those pretty boxes. During my first trip to Tokyo, I had no idea what to buy at the airport. I saw people buying lots and lots of colorfully wrapped boxes, but I wasn’t sure what was in them. I think I ended up buying a box of Tokyo Bananas and some matcha flavored Kit-Kats before hopping on my flight. In this post, I’ll go over the way that the box is wrapped, and some of the main ingredients, and of course, most importantly what the treats look like and taste like. In all honestly, you could do all your shopping for friends and family at either Haneda or Narita airport. Just leave yourself enough time (I think I had about two hours) and you will find something there for everyone on your list, at all price points. Some items are unique to Japan, and at pretty reasonable price points. For example, I love the Yojiya facial blotting papers. Yojiya also has a yuzu (grapefruit) lip balm that smells exactly like the real thing that would make a lovely gift too. Both items are compact in size, lightweight and therefore very easy to transport. Where you will really be dazzled by the variety of choices is in the edible gifts section. You will see stacks and stacks of colorful, neatly wrapped boxes… and spend a lot of time wondering what is inside. Just look at those crisply wrapped corners! Some of the displays have sampuru (realistic looking plastic models) and a few may offer free samples. However, for the majority, you will have to read the ingredients on the back of the packaging, or if you’re like me, just buy based on how pretty the packaging is. I’m happy to report, that has worked out remarkably well this time around. First up, is the classic treat, Tokyo Banana. The wrapping paper is a distinctive yellow, with a banana sporting a cheerful blue bow. The cardboard box inside is also printed with their logo and banana. This box contains eight, individually wrapped Tokyo Bananas. They are sponge cakes, shaped like bananas, and filled with banana flavored custard filling. On a side note, my 89 year old grandma loves these. She loves the combination of the soft texture of the cake, and the ooey gooey banana filling, so I always make sure to bring back a box for her. The interior of the box is also lavishly decorated, with a frosty mountain, snowflakes, and a promise of a “feeling of satisfaction.” Which is, by far, not even an exaggeration. Once you lift the lid of the box, and see those orderly rows of square cookies, how can you feel anything but satisfaction?! 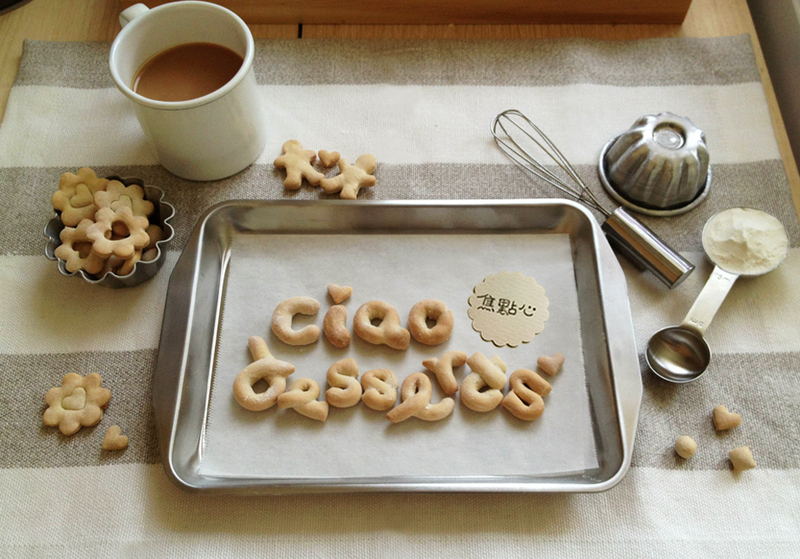 Each square compartment holds four cookies, bound together by a clear, plastic band. (For my particularly sharp eyed readers, you’ll notice that one is missing… because I ate it). The white chocolate to wafer ratio, is extremely precise, by the way. I also picked up a box of these Maccha Bar chocolates from Royce. Just look at those orderly rows of chocolate. Sigh. In my imagination, these would be solid bars of matcha…. but OOPS. They aren’t, and I have known that if I had thought to read the box more closely. Instead, it’s matcha, with almond, pecanut cashew and puffed rice. Biting into one, you can imagine that this bar is almost, healthy. All the nuts, and puffed rice and whatnot makes it seem almost like a granola bar. The matcha part was on point, I just didn’t care for the other additions. However, the friends I bought this back for, rated this particular bar above the KitKats. Lastly, I want to share with you my “surprise,” “judge a book by its cover, judge an omiyage by its wrapping paper” find~ this light blue box, which I originally thought of to be something else. After you tear away the outer wrapping, the box is still pretty- reminiscent of winter wonderland, and a shower of stars. To my surprise, it was six mystery bars, labeled blueberry, caramel, marron (chestnuts) with black, milk and white chocolate. These bars consist of crispy wafers, sandwiched with the different flavors. This one is the caramel one, and it’s just the right amount of sweetness, and the caramel flavor really shines through. The most outstanding flavor combination in this box though, was the dark chocolate and blueberry bar. Dark, slightly almost bitter chocolate, with tart blueberry jam. Divine. I would recommend this box as an all around crowd pleaser. That way, everyone can sample a little bit of everything, without being too overwhelmed. Also, they can decide for themselves whether they want to buy it for themselves the next time they are flying out of Tokyo. My last tip is, you can never, ever buy enough packages of KitKats. I bought a few packages from one of the drugstores, and I wish I bought more. First off, they work wonderfully as crash pads in your suitcase, to cushion some of your more fragile purchases (more on that later!). Secondly, I have not met a single person who did not like them. I bought three flavors this time, the classic matcha, a dark chocolate, and strawberry. The strawberry caused such an unexpected clamor, among even my most emotionally stable friends. So, buy as many different KitKats as you can, and prepare for your popularity to skyrocket. Information: For a list of all the duty free shops available in Haneda Airport, please see here. The duty free shop where I bought my omiyage is TIAT (Tokyo International Air Terminal), and there are several locations dotted throughout the gates. I would choose the TIAT kiosk closest to your gate, because those boxes get insanely heavy. I seriously thought my arm was going to snap off during my trek to the gate. Please keep in mind that sometimes the checkout lines are long, so make sure to allocate enough time so you can make your flight! This is not a sponsored post. All experiences, viewpoints, and opinions expressed are my own. I paid for all items consumed with my own money. This entry was posted in Uncategorized and tagged airport, desserts, duty free, duty free shopping, gifts, Haneda Airport, Japan, omiyage, shopping, Tokyo. Bookmark the permalink.